Is everybody ready for some more backstory? Cause here comes young David, the phantom’s former possessed protégé, woken from a deep sleep by the haunted refrain. Like every kid in 1969, David is drawn to “Quentin’s Theme” like a magnet, and he shows up at the door just at the moment that Quentin announces no, he doesn’t recognize the song, and what are you even talking about. Hearing David outside the door, Julia bundles Quentin behind a curtain, while he rolls his eyes and thinks, oh what the hell is it now. Life is already challenging for a recovering amnesiac, without all the shenanigans. David’s kind of freaked out, as anyone would be — Quentin’s ghost possessed him, and spent several months almost killing him. Naturally, he’s upset that Julia is hanging out in his tormentor’s old bedroom, reopening wounds. “Quentin’s back, isn’t he?” David says, looking anxiously around the room. Julia says no, of course not, I just happened to be standing here, and decided to host my own private top 40 countdown. “He told you to do it, didn’t he?” the boy insists. “He tells you to do something, and then you have to do it! I remember! You’re hiding him!” Julia says don’t be ridiculous, of course I’m not doing the thing that I’m obviously actually doing. Julia usually lies at an average of 1.2 times per sentence; her truth-o-meter is permanently stuck at Pants on Fire. 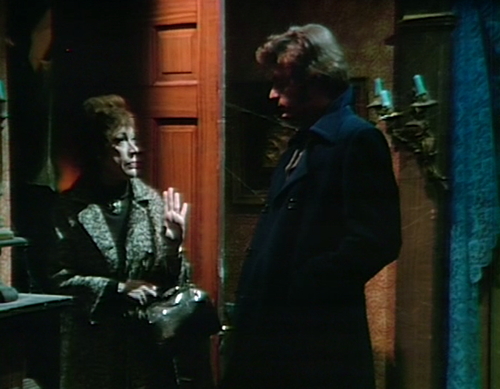 After David leaves, Julia and Quentin have an extremely Dark Shadows conversation. Quentin: So I take it that you and Barnabas aren’t the only ones who know Quentin Collins. Quentin: That requires an explanation, too. Does everyone in this house know him? Julia: No. The children do. Quentin: Oh, so you think that’s what I’ve done. Well, no wonder you’re interested. A ghost with amnesia! You know, that could really be fascinating. I might be able to forget that I’m dead. Julia: I treated you in the hospital, I know you’re alive. Quentin: And the kids saw a ghost. How do you explain that? Julia: I want you to explain it to me. And then he’s like, no, I want you to explain it to me! And that’s pretty much the whole rest of this plotline, which lasts forever. That’s what he has to swallow — ghosts, time travel and magical spells, and as long as you’re explaining the portrait, you might as well throw in the werewolf stuff too. Julia is basically saying, you know The Turn of the Screw, The Picture of Dorian Gray, The Pit and the Pendulum, The Maltese Falcon and The Wolf Man? Well, that’s what happened to you this year. So it’s no wonder he’s lost; narrative collision on this scale makes it hard to construct a coherent worldview. There’s a point where these stories just aren’t going to add up. The really tricky thing is the time travel theory, which makes no sense and doesn’t pretend to. David remembers that Quentin was a ghost, which as of the 1897 intervention, he hasn’t been anymore. 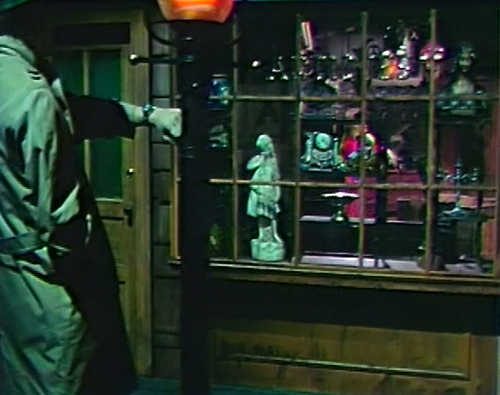 Apparently, at some point during Barnabas’ time journey, the ghost went away, because Quentin didn’t die and never haunted the house in the first place. This is one of those grandfather paradoxes, because if Quentin wasn’t a ghost, then Barnabas wouldn’t have traveled back in time. But he did, and apparently he was carrying one of those meanwhiling real-time tethers, which kept track of how long he’d been in the past, and adjusted history in synch with the amount of time he’d experienced since he left the present day. That’s not a very good description of how that works, but it’s not my fault; it’s not a very sensible plot point. It’s the kind of thing that works on a gut level for the audience, because we followed Barnabas through the time trip, and for us, there was a “now” when Quentin’s fate was changed. It’s only when you think about the present day family that it seems strange: from their point of view, Barnabas disappeared, nothing happened, and then six months later, the ghost was gone. Every time travel story has to deal with the question of How Does Time Travel Work, and develop a consistent theory that explains it. Except for Dark Shadows, of course, which definitely didn’t, and neither did Doctor Who or Lost or Star Trek or pretty much any comic book. They just piled up a bunch of contradictory notions about how time travel might work, criss-crossing and handwaving as they went along. You do sometimes see a work of fiction that has a specific point of view about how time travel works. In Back to the Future and Ray Bradbury’s A Sound of Thunder, changing the past means altering history for everyone, and nobody remembers the way things used to be except the time travelers. In 12 Monkeys and Connie Willis’ To Say Nothing of the Dog, history can’t be changed — the time hopping is already accounted for in history, fitting together like a jigsaw puzzle. But you’re much more likely to get a consistent theory of time travel in a single work of fiction, like Back to the Future and 12 Monkeys. The writer has complete control over the entire story at once, and can make it work however they want. In serialized narrative, things get complicated. Plans change, new story ideas come up, and all of a sudden the way that time used to work isn’t the way it works anymore. In fact, for 12 Monkeys, the movie and the TV adaptation have different ideas about time travel, because it’s hard to stretch the jigsaw puzzle model to 26 episodes and counting. So here’s the current version: Everybody remembers that Quentin’s ghost ruled Collinwood on Valentine’s Day 1969. Then Barnabas went away for a while and did something, and Quentin’s ghost went away. They made that clear as soon as Barnabas came back to the present day, in mid-November. His conversation with Liz is especially striking, because of her casual way of referring to the science-boggling events in her life. Liz: How do you feel now? Such a ghastly experience. Barnabas: Well, I’m sure you’ll understand if I tell you that I’d rather not talk about it. 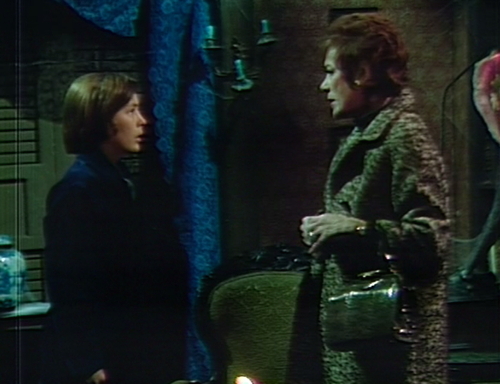 Liz: But the ghosts are gone now, and if you had anything to do with it, we’re most grateful. You cannot imagine how happy we are to be back in Collinwood. This is an odd way to play it, but that’s how Dark Shadows operates sometimes, and as I said, on a gut level it feels okay. If Barnabas just came back and everybody went on with their lives, we wouldn’t think about it one way or another. The element that exposes the weirdness of this premise is that as of the end of the 1897 storyline, Quentin is alive and immortal, traveling through time at the standard rate of one hour per hour. The Quentin that’s currently giving Julia a hard time lived through every day from 1897 until right now, which means that on Valentine’s Day 1969, there was a ghost Quentin haunting Collinwood and a live Quentin visiting the Hi Hat Lounge at the same time. Or, if not — and obviously, it must be not, mustn’t it? — then what parallel world has “Grant Douglas” been traveling through? Did he experience an early 1969 where Collinwood wasn’t haunted, and once Barnabas returned, his timestream dovetailed back into this one? Or what? One of the cameras is acting up. In the teaser, when the scene switches from Quentin’s room to David’s, there’s a flash of blue streaks across the screen. During act 3, a scene with Liz and Julia also has blue streaks. Early in act 2, when the scene fades from David in the foyer to Alexander’s drawing, you can hear a couple faint bars of Quentin’s theme, for no particular reason. In today’s episode, Julia refers to Professor Stokes as Eliot. He’s previously been referred to as Timothy Stokes. Eventually, this turns into T. Eliot Stokes. This might be the first mention of Eliot, but I’m not sure and I don’t feel like checking. I’m sure somebody knows the whole history of Stokes’ evolving name, and they’ll probably post it in the comments within hours of this post going up. Also, there’s a new stuffed animal in the antique shop. It looks like an otter or a beaver or something. I’m apparently not that good at identifying television taxidermy. Love having an intelligent critic study dark shadows. I guess we’ll just have to take “Or what” into the Fanwanking Chamber and see what happens. And isn’t it cute? Pigweasel is having a slumber party with his friend Otterbeaver! I don’t think I’ve ever seen anyone (outside of professional fashion models) who wears clothes better than David Selby. I mean, the costumers probably fought over who got to fit his Victorian suits. But not even he can make early 1970’s men’s fashion look good. It doesn’t even look comfortable. It looks like it would fight every movement the wearer tried to make. His only choice is to outact it, which he does manage to do. Perhaps Barnabas created a brand new band of parallel time, and his return to the present re-fused that band with the one he left behind. So comma the current denizens of Collingwood each have to pass, but only remember the one that they’re used to. Oh, hell, I think we need a new coffee pot in here. I was but a lad when DS was aired originally, so I don’t remember much of the fashion trends of the era (apart from what The Beatles and The Who and The Rolling Stones and Elton John wore, which sided toward the sartorially extreme); but with David Selby now having joined the majority of male terrapins, I have to ask. Were turtleneck shirts and sweaters REALLY that popular, or was Ohrbach’s just overstocked and trying to flog them? ‘Grant’ed, they are handy for keeping the throat warm without having to bother with a scarf, and they do hide those pesky vampire bites well, but PLEASE! There must have been SOME other trends in menswear in the late sixties! 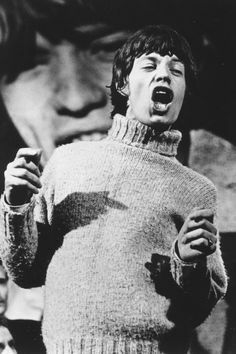 I believe there was even a photo poster of Mick Jagger in David Collins’ room that year, on the far wall just to the right of the window, though he wasn’t wearing a turtleneck in that photo. It makes character sense, too – they’re all Coastal New England types, descendants of seafaring men. Isn’t the coastal New Englander look more Irish cableknit sweater-ey, pea jacket-ey? Is it because it doesnt get that hot in New England? I do remember. Yes, turtlenecks were a thing. Okay, I took a trip into the Fanwank Chamber and here’s what I’ve come with. What do you think? I usually like the explanation that when you go back in time and change history, then you’ve created a new alternate time line that grows out of that change. So If Barnabas goes back and prevents Quentin from dying and then Quentin also becomes immortal thanks to the portrait, then a new timeline is created where Quentin never died and never haunted Collinwood. Now, we’re back in the present, but everybody still remembers Quentin haunting Collinwood. How can this be? Obviously, it isn’t Quentin they are remembering, but something else. Perhaps Quentin’s Astral Body with the mind of Count Petofi? When Petofi traveled to 1969 in Quentin’s body, to us the viewers, he seemed to be there for only a minute or two, but who knows how long his astral body was fluttering around Collinwood before Beth disturbed his journey? I submit that in the new timeline, created after Quentin’s’ history was changed, everybody in 1969 remembers the haunting because of Quentin/Petofi’s trip to the future, it probably played out differently than we saw it originally, but the main events were probably the same, David and Amy find a body in Quentin’s room (Trask’s), Astral body of Quentin/Petofi “haunts” Collinwood and possesses David, Barnabas and Julia investigate, Barnabas goes back in time. And he could have tricked Beth’s ghost into working with him at first, until she realized what was going on. Then she started undermining him, like when she saved Chris’s life and led him to the baby’s grave. We also have the problem of it not being Quentin that David and Amy would have found in Quentin’s room, but Trask. Petofi pretending to be Quentin works, but Trask maintaining a pretense like that is hard to believe. Even if he had a magical hand to give him the power, Trask thinks far too highly of himself to go about pretending to be anyone else. Man, if the Collins family thought being haunted by a pissed off Quentin was bad, they should try a pissed off Trask. Barnabas got haunted by a pissed-off Trask (the 1795 model, anyway). Dunno if Trask 2.0 would be a haunter, it sounds like that would be the Devil’s work to a man like him. Gregory went straight on to his reward. Whatever that was. So we have ghost-Quentin, Petofi-Quentin, and Quentin running around? My head hurts! As for no man being able to make early ‘ 70s fashions look good, I can certainly think of exceptions. The first one I think of is Bill Bixby. Damn, I had forgotten the Bixby Principle. Do a Google image search for ‘1970s men’s fashion pictures’ and tell me what looks good to YOU. WARNING: You cannot unsee the images thereon! Have you seen the film “Impulse” with WIlliam Shatner? Now, THAT is the epitome of 70s men’s fashions! Why bother with turtlenecks when you have a collection of shirts like that? Rock Hudson on ‘McMillan & Wife”! Oh, those wide, wide ties! And the pornstar mustache. In Professor Stokes’ first appearance in episode 464 back in 1968, he is credited as Timothy Stokes. At some point he may have abbreviated his first name alongside his middle name, as scholars often do, and went on as T. Eliot Stokes. Surely Julia wouldn’t refer to him by middle name unless Stokes himself had at some point declared it as his current preference. “T. Eliot” makes him sound more distinguished. It’s not really an “evolution” that can be traced; since it has no relevance to any story points, it’s simply an unannounced change done at some point off-script — perhaps even a preference of one or more of the writers on the current staff — the sort of personal makeover one would expect of a scholar. Likewise, in House of Dark Shadows, he is also credited as Professor T. Eliot Stokes. Well, the story as far as I can figure is that he was introduced as Timothy Stokes, but everybody just called him Professor Stokes, so the writers forgot that he had a first name. At some point (possibly this episode), they wanted a first name for him, and forgot that he already had one, so Julia calls him Eliot Stokes. And then sometime later, they realized that they’d given him two first names, and that’s when he became T. Eliot Stokes. Hey, they didn’t give Reverend Trask a first name at all! They had to do something with that extra moniker. And students looking to cite his work will forever get him mixed up with TS Eliot and TE Lawrence. The explanation I think I recall encountering eons ago (possibly even in a reliable source) is that it was Thayer David who wanted his character to be given the full name Timothy Eliot Stokes. Bibliophile Thayer wanted the character’s name to be evocative of TS Eliot. That would be a fun research project that would take up several evenings, because one would have to watch all the episodes in which Stokes appears to this point, which would be a few dozen in all — but this also means checking every Dark Shadows Wiki episode page between 464 and 911, to note down which episodes those were. Yeah, I thought it was possible that you’d already done that work, since you and I are both members of the small group of people who would even consider doing that. Maybe we can sucker somebody else into doing it. I’ve been using the bio pages, trying to find out which episode had a scene with Thayer David & Humbert Allen Astredo, but can’t pinpoint it. I seem to recall it was a Petofi\Hanley scene, where Petofi uses his evil powers to bring Hanley under his sway. He is so successful that Hanley starts agreeing to things that Petofi hasn’t yet ordered! Thayer David nearly breaks up, trying to get his lines out, as Astredo keeps “I understand completely” and “of course”-ing away. Yes, I just a moment ago had a look at that page. So up to this point there are 53 episodes featuring Professor Stokes between 464 and 910. When I think of a scene with Thayer David and Humbert Allen Astredo, I think of the one in 1968 when Professor Stokes arrives at Nicholas Blair’s house by the sea to invite him to a dinner party that Barnabas will be giving at the Old House, which is really just a ruse to get Blair out of his house for a while so that Barnabas can get access to the property and have a look around. I believe Barnabas and Julie had hatched a plan to do away with Eve. Then later Stokes and Blair are sipping sherry in the Old House drawing room discussing eighteenth century architecture. I don’t recall the episode number offhand, but it was in 1968 during Angelique’s vampire phase. 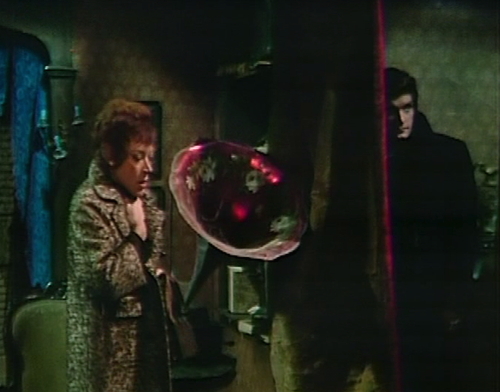 The key to understanding DARK SHADOWS is accepting that it’s usually a mistake. 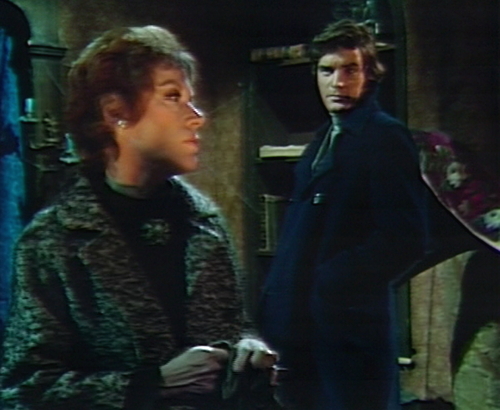 But DARK SHADOWS, host to so many narrative collisions, is also a genre collision: Sci-fi/fantasy/horror/etc and soap opera. Soap operas are famous for not making sense — there’s never an explanation for why Nikki Newman has grandchildren only a couple decades younger than she is. What matters most to soap opera fans, I’ve found, is consistency of character: As long as Victor behaves like Victor or Marlena behaves like Marlena, the fans are forgiving of the most outlandish plot developments surrounding them (barring demonic possession). Since I discovered DS fandom in the mid-90s online, I’ve been intrigued by how the series has two distinct sets of fans — those who don’t watch other soap operas but love DS the way they love anything with vampires in it provided they don’t sparkle. These fans roll their eyes at the thought of Burke Devlin or mysterious pens. The other set of fans love the series as a soap opera — a very “peculiar” one (to borrow from Nancy Barrett) but a soap opera nonetheless. They are the ones who care about Victoria’s parentage or who adore Barnabas and Julia as a super couple. The logistics of time travel matter little to them (just as the logistics of time travel in SOMEWHERE IN TIME aren’t that important to them). This “battle of genres” in DS is ongoing. Generally speaking, the soap opera genre always cedes to the sci-fi/fantasy/horror spook show. Right now, the series is more of a soap opera than it’s been in years. There’s arguably not even a real monster on the show (excluding the off-screen deep breathing obscene phone calling one). Emotion is driving the series as much as plot if not more. This will soon change with Episode 951 (possibly 935 depending on your POV). I enjoy the show more after this point for what it’s worth. I just like the fact that we’re trying to tie up all these loose ends, fifty years on! Belated reply to this: since we’re discussing time travel anyway, let me put forward the suggestion that the ONE thing Barnabas changed by traveling back to 1897 was Professor Stokes’ first name. I think that DS needed the same story editor from all the Back to the Future movies. Talk about consistency. And Dan Curtis and company would have to pledge to follow what the story editor says. I gave up on trying to figure out all these time-travel paradoxes some time ago. The upcoming 1840 storyline makes things even worse. They actually didn’t have a script editor at all. Nowadays, soap operas have more than a dozen people working on scripts, including head writer, associate writers, scriptwriters and script editors. Dark Shadows had three writers, plus Dan. Oh, I know they didn’t have a story editor. They sure needed one. Agnes Nixon filled the function (among others) when she was head writer/executive producer of One Life to Live and All My Children, and it really showed when she left OLTL, what with all the rewriting history that occurred. But during the 60s and 70s, DS was by far the soap most in need of a story editor. I’ve always found the concept of going back in time and changing the past completely unacceptable. That’s probably because I was first introduced to the notion back in the early to mid-1960s in Superman comic books, when it was established that one of the relatively few things that Superman cannot do, no matter how hard he may try, is change the past. Superman could travel back in time, but whenever he tried to change history, either something would happen to prevent him from doing so or his efforts to cause the change would actually become part of the historical sequence that made things happen precisely as they did all along. So Superman eventually gave up on even trying. Of course, this was later revised in comics and the movies to allow Superman to change the past, such as in the first Christopher Reeve Superman movie, where he changes the immediate past to save Lois Lane’s life — which galled me at the time (and still does), dedicated as I am to the idea that one cannot change the past. Of course, modern sci-fi writers and physicists alike who buy into the notion of changing the past have accommodated it with the idea of “multi-verses” and “alternate timelines.” If you accept this, then you accept the concept of an infinite number of universes dancing on the head of a quantum singularity. Personally, I don’t buy it, not even as good science fiction. I recently watched a TV program featuring theoretical physicist Stephen Hawking in which he postulated (even insisted), through very logical and physics-based means, that the past, once it occurs, cannot be changed. In fact, he maintained that time-travel into the past is itself, quite simply, impossible. It cannot, cannot, CANNOT be done. Interestingly, however, he also maintained that time-travel into the future can be done — only that, if someone were to travel into the future, they would then be stuck there, unable to return to their former present, which has now become the past. Let me tell you, it did my heart good. 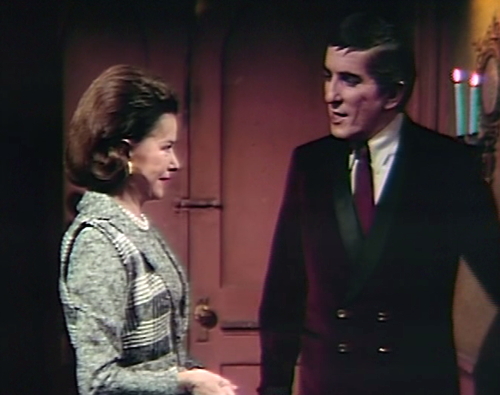 In short, I liked the fact that in the first DS time-travel scenario (Victoria’s visit back to when Barnabas became a vampire), DS didn’t really change the past in any substantive way. That made good storyline sense to me, and it didn’t cause any narrative difficulties. But in the second major DS time-travel scenario (Barnabas going back to Quentin’s time), they did change the past, and quite substantively. Doing so caused all sorts of narrative nonsense and convoluted logic. It has always irritated me. But it’s understandable why they did it. Quentin/David Selby had become hugely popular, and they had to figure out a way to keep not only the actor but his character, in which the audience had become invested. Ratings trump logic, and if the writers and viewers are left to deal with assorted imponderables, so be it. What does Hawking have to say about vampires and werewolves? I kid. I kid. Time travel is the ultimate wish fulfillment. Who doesn’t want a “do over” in life? To be able to correct past mistakes with current knowledge? That’s a major part of its appeal as a plot device. For example, would BACK TO THE FUTURE be as satisfying if Marty only managed to ensure that his parents met so he would continue to exist? No, audiences love that Marty’s actions made his own, er, future far greater than what it was when he’d gone to the past. 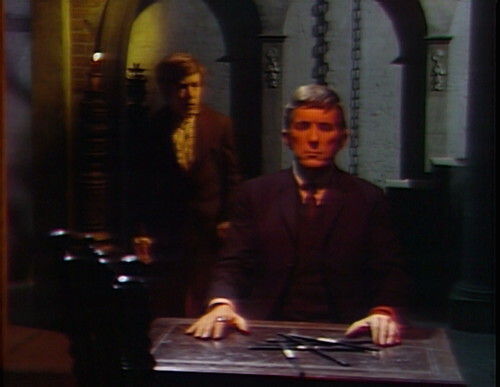 And by those rules, DARK SHADOWS never changed history with a capital “H.” Quentin Collins living creates no ripples or disturbances to the timeline (although, Barnabas and Julia change events in 1840 so drastically they should have major repercussions but they are never discussed). Dramatically, Vicki’s excursion in the past was unsatisfying in every way. She is not an active protagonist. In BTTF, Marty prevents his parents from meeting because he risks his life to save a young George McFly. That’s a great character moment but one that endangers his life. Vicki just screws up, alienates people, and winds up being set up as a patsy. She then takes a backseat to the antagonist Angelique. Arguably, events proceed as they did when she wasn’t there originally. While that might be “responsible” time travel, it’s not responsible writing of a leading character. DS writers seemed to realize this mistake and tried to retroactively claim Vicki’s trip mattered (beyond providing a vehicle for an extended flashback). When she killed Noah Gifford, she apparently saved Daniel’s life and thus the modern Collins family. Her visit also somehow let Angelique know that Barnabas escaped his chained coffin. This was all made up on the spot and never stated during the 1795 story itself but it was part of the writers efforts to provide the story with stakes. Wayne, Stephen, anyone who cares about time travel theory: you should read “To Say Nothing of the Dog”. It’s about really smart, funny people worried that they’ve accidentally changed history, in a very small way that could potentially result in England losing WW2. It’s a science-fiction romantic farce, so there’s a lot of running around and misunderstandings, but the core of the story is two people falling in love as they figure out how time travel actually works, and whether they’ve destroyed the world or not. It’s one of my top five all-time favorite books. The is a far more serious (sort of) prequel by Willis, Doomsday Book; a short story, Fire Watch; and two subsequent novels, Blackout and All Clear, that deal with the same theory of time travel. Different characters, but just as wonderful. Doomsday made me sob. The others are harrowing (they take place in WWII), but end in hope. Oh, and if you die in the past, you’re dead. No do overs. Stephen, it’s interesting that you should mention Lincoln’s assassination. If I recall, there’s a classic episode of The Twilight Zone in which a modern man (portrayed by Russell Johnson, who would later gain greater fame as the Professor on Gilligan’s Island) somehow found himself in the past in Washington DC on the evening of Lincoln’s assassination. He tried to prevent it from occurring, only to discover, much to his dismay, that his attempts to stop it actually furthered the course of action, making him an inadvertent facilitator of the assassination. The implication, of course, is that he, the time-traveler, had always been part of history. So presumably going back and saving “Joe Schmoe” would also always have been part of history — only it’s pretty much irrelevant history (assuming there could be such a thing). I find it fascinating the way people talk about “time-travel paradoxes.” In my opinion, paradoxes are paradoxes only because they can’t possibly exist. It’s our attempt to posit an impossibility that creates the paradox. In essence, there is no paradox since it simply cannot occur. I haven’t watched that TWILIGHT ZONE episode in years. I should revisit at New Years for my annual marathon. Time travel stories are often based on big events and big moments. So, you stop Lincoln’s assassination by trying to stop the actual big event rather than any of the smaller events that made it possible. And of course, if you want Clinton to win the 2008 Democratic primary, you just prevent Jeri Ryan from going to her Star Trek Voyager audition. Thanks for the correction. It’s been a very long time since I’ve seen that Twilight Zone episode, so my memory was flawed. Maybe I was remembering one of those Superman comics…. A few years ago while watching Russell Johnson travel to 1865, I happen to notice that the man playing Lincoln’s assassin, John Wilkes Booth, was actor John Lasell, whom I recognized because of Dark Shadows. Lasell had played a paranormal investigator named Dr. Peter Guthrie on DS, who was a foe of Laura Murdoch Stockbridge Collins Radcliffe Collins Collins during the first phoenix storyline in 1967. (Yes, she has a long and rather sick marital history.) The good doctor Guthrie battled valiantly with help from Victoria Winters to save young David Collins from mama’s firetrap. The malicious motherbird tragically set Dr. Guthrie on fire while driving his car. Shortly thereafter she herself became a pile of ashes and feathers at the barbecue she hosts every 100 years. Hope I listed her marital history correctly. 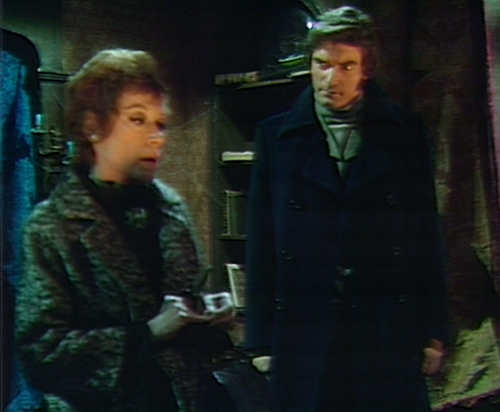 Guthrie’s demise was really a shame because I enjoyed John Lasell’s portrayal of Dr. Guthrie, and would have preferred him to stay awhile longer on Dark Shadows. Wow! Really? I have the complete Twilight Zone on DVD and I never noticed that! I’m presently viewing the Dr. Guthrie era part of the Phoenix story. He was really great in that. I’ll now have to take another look at that Twilight Zone episode, so I can place John Lasell. The only previous thing I’d been able to trace from him was from the movie Flipper. John Lasell is still alive. Too bad he never was interviewed or went to a convention. He appeared in just about every episode during the time he was on. There has been a lot of angst over what happened to Phyllis Wick, the original governess that Vicki replaced in 1795. When Barnabas & Julia return from 1840, the Summer 1970 events are erased. I regard 1840 as another parallel time to offset all the changes. Though Quentin’s haunting is totally forgotten by the Summer of 1970 to the point that David appears to not know he was possessed by Quentin. 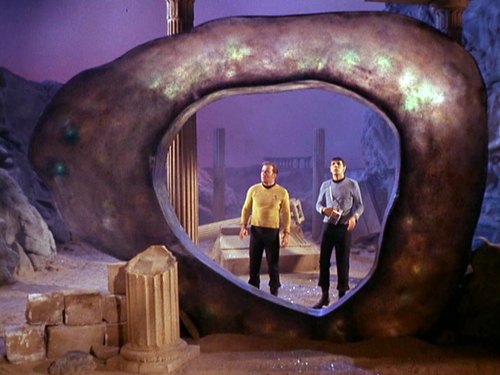 Which is another time travelling trope. That people still remember the ‘real’ history before time travel changed it, but the memories fade over time until they can only remember the revised timeline. I always found the concept of going back in time to change history in aid of the ones you love terrifying- because you could never be sure you didn’t just abandone those versions for their alternative counterparts in a new separate time band. Dark Shadows dealings with this are interesting because this example while technically wonky is somewhat satisfying because it confirms that our beloved characters who were in peril are now rescued- and not just replaced with oblivious alternate versions of themselves who have not grown or developed from the experience. Later when they contradict their previous approach and do the logical thing – returning from 1840 to a happy clueless collinwood that doesn’t remember the destruction, insanity and death that they suffered is just very unsatisfying – they don’t know the trials the others endured to save them and never truly can, and we as an audience don’t feel that the people who experience the destruction are truly saved. Especially when you consider how often she pulls it on Stokes. He must be the most patient man in the world. Blooper update: The phone on the desk at the antique shop switches back and forth from a black dial phone and a tan push-button phone. The tan phone returns in this episode. Also, even though child-rearing was different in the 1960s, I don’t think anyone would have (or certainly should have) left children alone in an open retail business to watch the place and play in it while the adults are gone. Also, where is Grant/Quentin going to go when Julia dismissed him from Collinwood in the middle of the night? He is always saying he has nowhere to go, and my sense was that in the previous episode, Julia was taking his care off of Olivia Corey’s hands. She went to bed anyway after Julia and Quentin left.